One function of the Water Department is to monitor the status of LADWP’s environmental projects and mitigation projects throughout the Owens Valley. Under the Inyo/Los Angeles Water Agreement and the 1991 EIR concerning LADWP’s groundwater pumping in the Owens Valley, the Inyo/LA Technical Group must prepare annual status reports on the EIR’s mitigation measures, on mitigation measures subsequently adopted by the Inyo/LA Standing Committee, and on Enhancement/Mitigation projects. The Water Department has prepared a series of tables which summarize the status of the mitigation measures adopted at the time the 1991 EIR was approved. The tables are intended for use by the Technical Group in preparing the annual status reports. 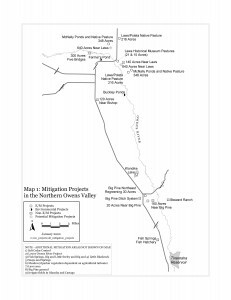 Mitigation Status Report of the EIR’s mitigation measures, mitigation measures subsequently adopted by the Inyo/LA Standing Committee, and on Enhancement/Mitigation projects. In February 2006, an Ad Hoc Group consisting of representatives from the Parties and ranching interests met to discuss alternatives to the draft plans. The Ad Hoc Group operated with a consensus-based approach as a means of recognizing all parties’ interests. 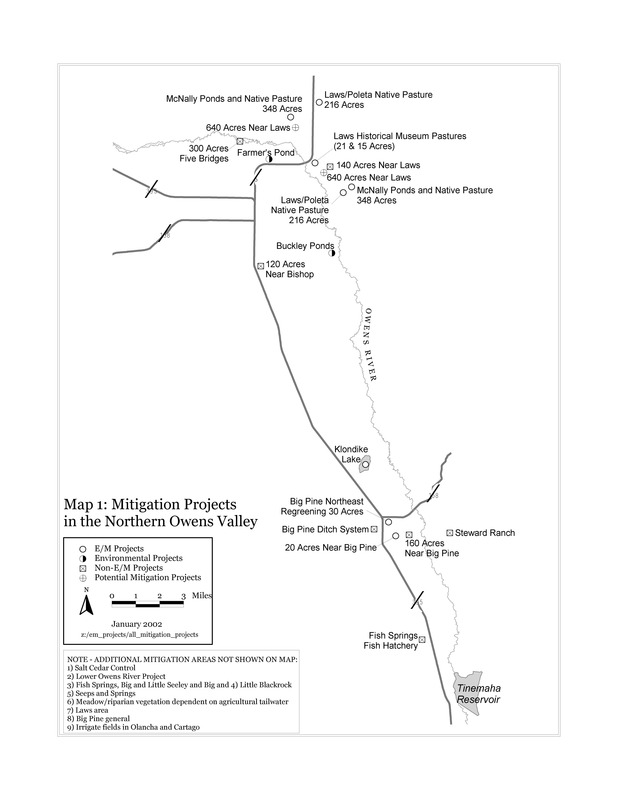 The Ad Hoc Group met on a regular basis, and developed and, in November 2008, agreed on a set of projects that they believe would fulfill the commitment in the MOU that LADWP provide 1,600 acre-feet of water per year for the Hines Spring mitigation measure and additional mitigation. 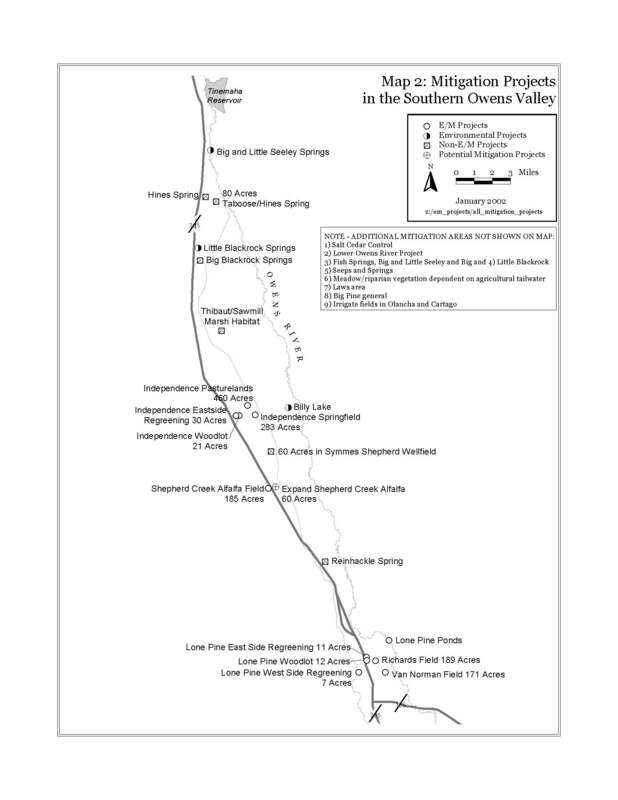 Lower Owens River Project (LORP) – The Lower Owens River is located in the southern Owens Valley. An approximately 60-mile reach of the Lower Owens River was diverted to the Los Angeles Aqueduct in 1913 to supply water to the city. DWP is required to re-water this dry section of the river. Revegetation Program – The EIR identifies approximately 1,300 acres of Los Angeles land in the Owens Valley that were adversely affected by Los Angeles Department of Water and Power groundwater and surface water management. The EIR requires that these lands be revegetated with plant species native to the valley. 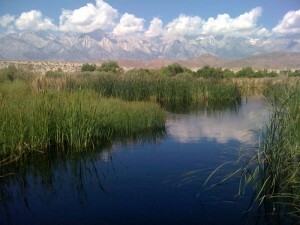 Saltcedar Control – The Saltcedar Program is responsible for controlling all saltcedar, a non-native invasive species, on LADWP lands within the Owens Valley. 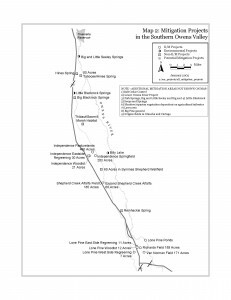 The Water Agreement provides for ongoing monitoring of conditions in Owens Valley, and mitigation of any impacts that occur due to LADWP’s groundwater pumping or changes in surface water management. If a significant impact occurs, the Technical Group must prepare a mitigation plan. Vegetation parcel Blackrock 94 is a 333 acre parcel of alkali meadow vegetation located in the Thibaut-Sawmill well field, southwest of Black Rock Fish Hatchery. The Technical Group considered evidence submitted by the County concerning conditions in the parcel, but was not able to reach agreement as to whether a mitigation plan should be prepared. The County submitted the issue to dispute resolution, and a mediation/arbitration panel was convened to resolve the dispute. On October 21, 2013, the arbitration panel issued findings and partial interim award. This Fact Sheet summarizes the dispute, findings by the panel, and next steps.